The following sections describe three methods for installing Internet Explorer 9 on computers that run Windows 7 during a pilot. You can choose to install the web browser manually on each computer, by running the installer, or you can add Internet Explorer 9 as an update to your Windows 7 images. Additionally, because many IT pros use the Microsoft Deployment Toolkit (MDT) to deploy Windows 7—even in lab environments or during a pilot—this section also describes how to update an MDT deployment share with Internet Explorer 9 . One prerequisite update is required to run Internet Explorer 9 on Windows 7. When you run the Internet Explorer 9 installer, it automatically downloads and installs this update. When you update a Windows 7 image or add the Internet Explorer 9 update package to an MDT deployment share, you must add the prerequisite update. Table 1 defines this prerequisite update. This update provides new functionality and performance improvement for the graphics platform. This update provides performance improvements when you print from XPS-based applications to GDI-based print drivers. This update resolves some streaming issues that are related to Media Foundation. Installing Internet Explorer 9 is fast. The installation requires fewer decisions and less overall time than does Internet Explorer 8. Also, the Internet Explorer 9 installer automatically downloads and installs the required updates as part of the process, eliminating the need to install prerequisites in advance. You can install Internet Explorer 9 from the Internet Explorer homepage. Online installation is the simplest choice for end users, but IT pros will want to download the installer and make it available to pilot users. The Internet Explorer 9 offline installer supports numerous command-line options that can also help you to automate installation on computers that are already running Windows 7. Table 2 describes these command-line options. You can download the offline installer from the Internet Explorer homepage. Runs the installer without any input from the user. Runs the installer without any input from the user, and without showing the user interface. Installs Internet Explorer 9 without checking for updates. Installs Internet Explorer 9 without making it the default web browser. Turns off the SmartScreen® Filter and Compatibility View features. Installs Internet Explorer 9 without restarting the computer. Installs Internet Explorer 9 and always restarts after installation. Creates a log file in the folder that is specified by Folder. Extracts the contents of the installer in the folder that is specified by folder; used to extract the update package (MSU file) to add to a Windows 7 image or an MDT deployment share. You can add the Internet Explorer 9 update package to Windows 7 images by servicing them offline. This approach integrates Internet Explorer 9 into the images so that you can deploy Windows 7 with the Internet Explorer 9 to pilot computers, without any post-deployment installation. This helps standardize desktop configurations and makes them easier to support. To update a Windows 7 image with Internet Explorer 9, you must first download the update package (MSU file) for each prerequisite that is listed in Table 1, as well the Internet Explorer 9 update package. Download the correct update for the type of Windows 7 image that you are updating (x86 or x64). Table 1 provides links for each prerequisite update package. To get the Internet Explorer 9 update package, run the offline installer with the /x command-line option to extract its contents. Copy the update packages into one folder, such as C:\Updates. This folder should contain only the update packages that Table 1 lists, as well as the Internet Explorer 9 update package. All of these files have the .msu file extension. Do not copy any CAB files that the installer extracted when you ran it with the /x command-line option. Figure 5: Use DISM to service Windows 7 image offline. For more detailed information about servicing a Windows 7 image, see Phase 5: Managing and Servicing Your Windows Image in the Windows Automated Installation Kit. For detailed information about DISM command-line options, see Operating System Package Command-Line Options. If you use MDT to install Windows 7 in a lab environment or to support your Internet Explorer 9 pilot, you can add the prerequisite update packages and the Internet Explorer 9 update package to your deployment share, as shown in Figure 6. During deployment, MDT will automatically add the updates to the image during installation. 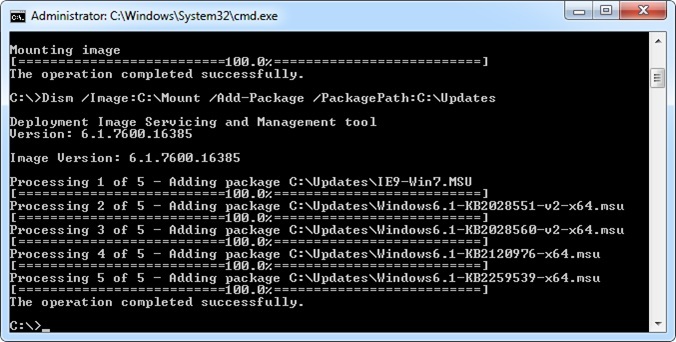 Copy the update packages to a single folder, such as C:\Updates. This folder should contain only the update packages that Table 1 lists, as well as the Internet Explorer 9 update package. All of these files have the .msu file extension. Do not copy any CAB files that the installer extracted when you ran it with the /x command-line option. In MDT, right-click Packages, and click Import OS Packages. Packages is under each deployment share in Deployment Shares. On the Specify Directory page, type the path and file name of the folder that contains the update packages that you created in step 1, or click Browse to locate the folder. Then, click Next. On the Summary page, click Next to begin importing the update packages. Click Finish to close the Import Package Wizard.